Single Property Websites and marketing tools built to generate leads. Rela’s property intelligence technology will import the property details for you. Upload unlimited photos, easily embed video and Matterport 3d. Choose a template and go live! Choose from one of our beautiful templates. Change at any time. Awesome. 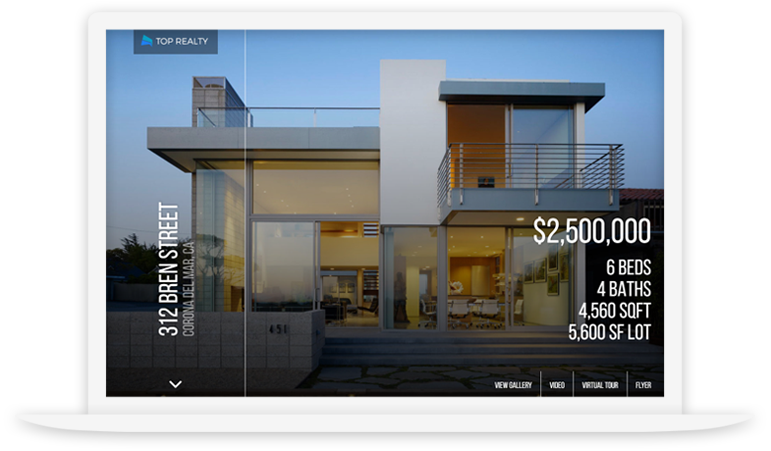 Our award-winning templates are the most beautiful way to present your listings online. Stand out with from the crowd with Rela. Our template designs are created with modern browsers and mobile devices in mind. Rela websites work perfectly on desktop and mobile. We give you the tools you need to drive buyer leads and impress your sellers. 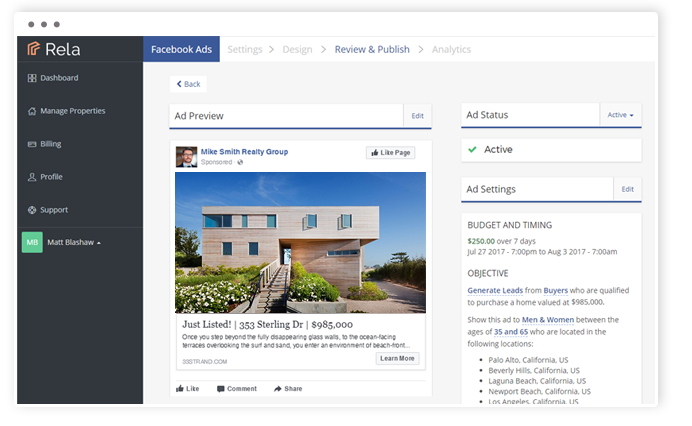 Rela integrates directly with Facebook’s powerful advertising platform and enables you to create and publish Facebook Ads right from your dashboard. We take the guesswork out of creating effective Facebook campaigns. Rela's ad-smart technology automatically identifies the best target audience based on your listing's location, type, and price range. 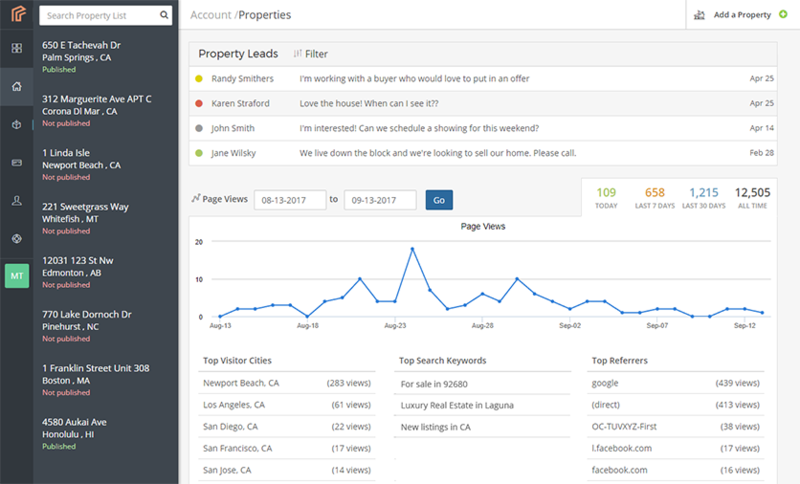 Track the impact of your marketing efforts from your property dashboard. See who's viewing your property and which campaigns are driving the most leads. Get notified as soon as a lead makes contact, route leads to team members, and never miss out on an opportunity to follow up and win the client. 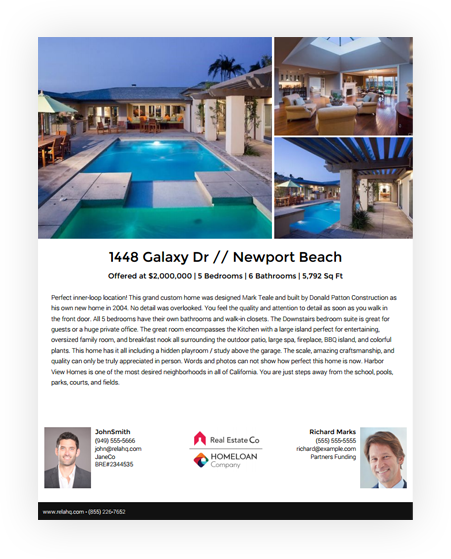 Need a flyer for an upcoming open house? 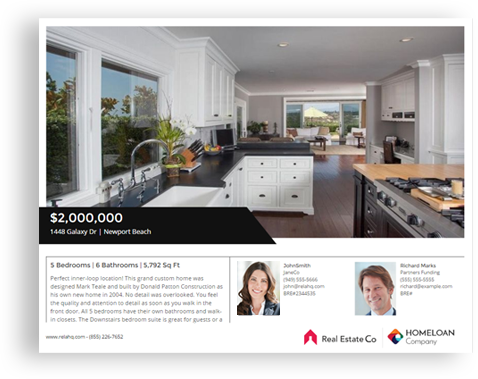 Rela makes it simple to create and beautiful high-resolution property flyers and brochures. Create unlimited flyers for any property at no additional cost. 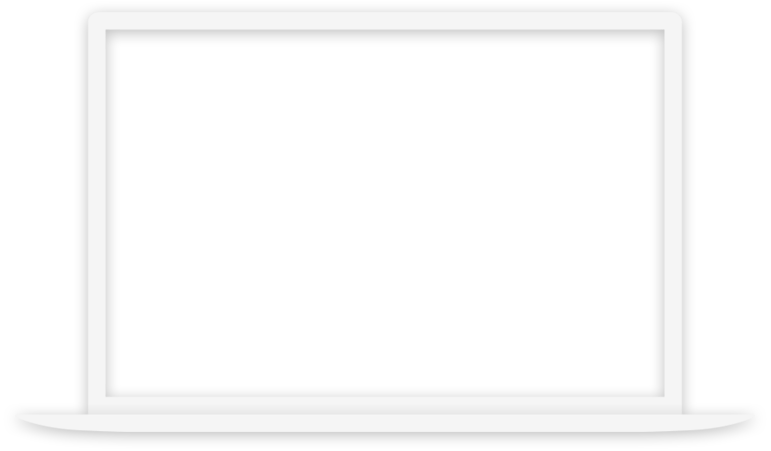 Our user friendly drag-and-drop interface makes it easy to customize without the need for a design professional. Once you've finalized your design, order professional quality prints directly from Rela! Send scheduled visitor reports to clients or team members. Our templates work perfectly on all devices. Our built-in CRM lets you easily track and manage leads! Purchase a custom domain directly from Rela or add your own domain right from your dashboard. Track page views, visitor counts, social referrals and more with our Advanced Analytics tool. ALSO: Custom Branding, Unlimited Photos & Video, FREE Hosting, SEO Built-In!